As part of our "Polar Pal" unit, we did a mini unit on penguins. 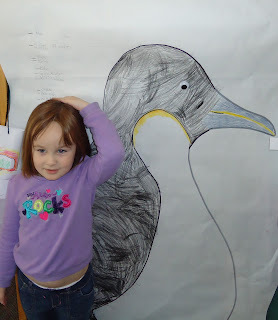 We learned all about the various types of penguins and the lands they inhabit. and then measured ourselves against it. Of course, we had to include "waddling" as part of our movement activities! We learned quite a bit about penguin rookeries and how the daddy penguins care for the eggs. 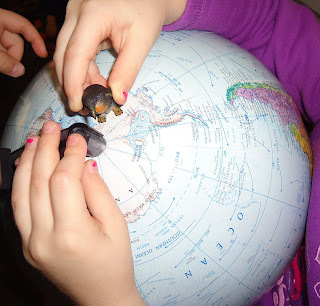 We practiced having the mommy penguins pass off the penguin egg to the daddy penguins. We had to remember to only use our feet since penguins don't have "hands". We also had to be careful not to let the egg drop to the freezing snow on the ground so the egg wouldn't freeze. This was much trickier than the children expected! the daddy penguins had to learn how to stay warm, rotating themselves from the outside to the inside of the huddle. We also practiced waddling as a group, so everyone stayed warm. It was quite a challenge to get everyone moving in the same direction! Our friend Ms. Christie game us this fabulous cardboard penguin cutout from the movie "Happy Feet". It's been a fun decoration and also helped illustrate how different baby penguins look from fully grown penguins! Our "Perky Penguins" have been a bit hit in our school lobby. Be sure to check out "Perky Penguins in Pre-K" to read more about them! I love that giant penguin! Thanks, Deborah! We had a lot of fun both making it and using it later in activities!